…Some of the Burgtheater’s more famous company members are familiar to even English-speaking audiences. Klaus Maria-Brandauer, for example, who was Oscar-nominated for his role in “Out of Africa” opposite Meryl Streep. Or Oskar Werner, who starred opposite Julie Christie in Truffaut’s “Farenheit 451”. …Max Burckhard, one of the more successful directors of the Burgtheater (1890-1898), allegedly got the job by accident after a mix up with his application for a position in a bank (possibly a myth). …The Burgtheater, despite its origins as the official national and imperial theater of the Hapsburg Empire, has an egalitarian tradition that continues today. If you’re prepared to stand, you can see a performance for just a few Euros. …The theater’s facade reveals numerous tributes to famous playwrights and poets. 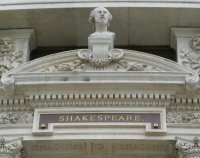 Including Shakespeare – honored with a bust and the “to be or not to be” scene from Hamlet. …A fresco above one of the opulent staircases inside shows a performance of Romeo and Juliet at the Globe Theater, London. The three artists responsible for this and other frescoes painted themselves into the Globe’s audience. …One of those artists was Gustav Klimt, who went on to achieve worldwide fame for such paintings as “The Kiss”. In 2006, one of his portraits sold for US$135 million.